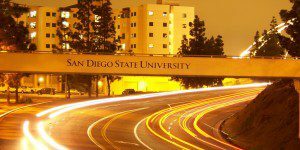 The San Diego State University (SDSU) Sports Management MBA program is generally completed in 18 months. Students spend the first year completing academic coursework, and then they work on a six-month consulting project. Each year between 25 and 35 students enter the program, which starts in January. The entire SDSU Sports Management MBA program consists of 48 units. During their first year in the program, students take thirteen courses in topics such as statistical analysis and sports marketing. After completing these core courses, students spend their final semester with a sports organization. With the oversight of a faculty mentor, students provide their host organization with a consulting report at the completion of their final term. The total tuition for the SDSU Sports Management MBA program is approximately $48,780 ($1,084 per unit). A $500 tuition deposit is also required. Students may receive financial support from graduate student loans or private scholarships. Veteran’s benefits may also apply. There is one fellowship offering for SDSU MBAs, as well as nine teaching assistantships, and 27 research assistantships. Students are required to submit previous institutional transcripts, two letters of recommendation, a professional resume, a personal statement, and an official GMAT score. Students looking to enroll in the program must have previously maintained a GPA of 3.0 or higher in their previous 60 semester units of undergraduate studies. An alumni admissions interview is also required so students may gain a better understanding of the program. International students may also be required to submit TOEFL test scores and financial documents to support an F-1 student visa. The SDSU Sports Management MBA program starts every spring. Applications for each cohort are accepted from August 1 to November 1.